The advanced phase of acute kidney injury can be fatal in even one in two patients. Fortunately, now it will be possible to detect the disease in its initial stages, when treatment is still relatively simple and the prognosis good. The key to this health and life-saving manner of diagnosis is a new polymer, designed at the Institute of Physical Chemistry of the Polish Academy of Sciences in Warsaw. The chemical heart of low-cost diagnostic tools capable of detecting the early stages of kidney disease may, in the near future, be a special polymer prepared by PhD student Zofia Iskierko under the supervision of Dr. Krzysztof Noworyta, in Prof. Wlodzimierz Kutner's group at the Institute of Physical Chemistry of the Polish Academy of Sciences (IPC PAS) in Warsaw. The polymer was designed and carefully constructed so as to particularly effectively entrap only one substance in its vicinity: lipocalin-2 (NGAL), a protein naturally occurring in human blood. For the clinician, an increase in the concentration of this compound in a patient is a valuable signal of still symptomless, but already developing, acute kidney injury. Work on the implementation of the polymer, funded by grant from the Polish National Centre for Science, was carried out in collaboration with the University of North Texas in Denton, the Warsaw Institute of Physics of the Academy of Sciences and the International Institute of Molecular and Cell Biology. "We deal with the creation of polymer recognition films for chemosensors that detect various substances. These include biomarkers and other biologically important compounds, whose presence or changes in concentration in body fluids carry information about the health of the patient. Our latest polymer can selectively capture lipocalin-2, a protein biomarker for acute kidney injury," says Dr. Noworyta. Acute kidney injury, earlier known as acute renal failure, affects about three in a thousand people. However, on hospital wards the situation is much more serious: up to 40% of hospital patients may suffer from this disease. With early diagnosis the effects of acute kidney injury are reversible. The clear symptoms of the disease such as fatigue, vomiting or altered consciousness, however, only appear at an advanced stage of its development when possible complications become a serious threat to life (in the most advanced stage, the mortality rate reaches up to 50%!). 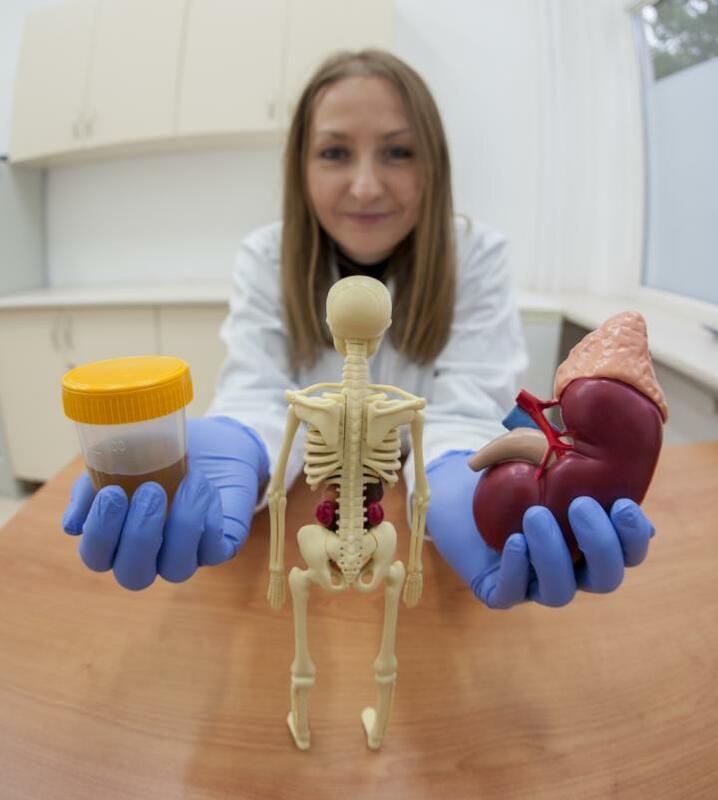 Kidney damage, which occurs in the late stages of the disease, may be permanent and require continued dialysis or even entire organ transplantation. "Before acute kidney injury develops, the concentration of lipocalin increases in patient's blood. So, we devised a polymer in whose structure there are molecular cavities that are a good fit for the shape and properties of the molecules of just this compound. The probability that any other protein will get caught in them is very, very small," explains PhD student Zofia Iskierko, the lead author of the publication in the journal ACS Applied Materials & Interfaces. The new polymer was prepared by molecular imprinting. Molecules of lipocalin were first surrounded by appropriately selected (so called functional) monomers binding with the protein at specific locations characteristic only for itself. Then, a cross-linking monomer was introduced which combined with the functional one. Those monomers were later subjected to polymerization, after which the lipocalin was washed out of the resulting structure. Finally, a stable polymer film was obtained with molecular cavities matching lipocalin molecules both in terms of their local chemical features as well as their size and shape. "When lipocalin molecules in the test solution come into contact with a polymer formed in this manner, some of them have the chance to be deposited in the cavities. Proteins, however, are quite large and they are reluctant to migrate through the polymer network. Therefore, the structure of our polymer had to be artificially loosened enough to ensure the lipocalin molecules had the best access to the greatest number of cavities, but not excessively, so that the polymer film would not collapse," describes Dr. Noworyta. The IPC PAS researchers obtained the required porosity, whilst retaining sufficient mechanical strength, by using MOF (metal-organic framework) inorganic-organic microporous materials. In terms of structure, MOF materials resemble three-dimensional lattices whose mesh sizes depend on the type of metal atoms and connecting ligands used. It was on this construction frame that the actual recognition film was fabricated. When the polymer had been immobilized, in the process of removing lipocalin molecules, the MOF skeleton – by this time redundant – was also destroyed. This treatment also resulted in an extension of the polymer surface, leading to an increase in cavities available for the protein molecules and ensuring better sensitivity of the chemosensor. The polymer mass increases after entrapping the lipocalin molecules. Therefore, if it were to be placed on a small piezoelectric oscillator, its easy-to-measure oscillation frequency would have to decrease. Another method of identifying the presence of lipocalin particles within the molecular cavities is to measure changes in the potential of the recognition film, which alters the current flowing in the processing field effect transistor component. Due to its simplicity and reliability, this latter solution would be particularly suitable for commercial chemosensors designed for mass production. "Our research is of a basic, laboratory nature. It is, however, still a long way from the preparation of a polymer capturing lipocalin to the mass production of low-cost detectors for the prevention and early treatment of disease," says Prof. Kutner. Niels Bohr, the great Danish quantum physicist, used to say that predicting was difficult, especially when it comes to the future. However, it seems reasonable to suppose that in the next decade devices detecting various biomarkers and warning early on of a threat to health will become an integral part of the ubiquitous smartphone. Diagnosis would then become as simple as testing blood sugar using today's glucose meters: it would suffice to connect a removable, simple chemosensor with an appropriately selected polymer recognition film to the smartphone, apply a little physiological fluid to it and… wait for the smartphone to display the result. Everyone would be able to carry out advanced medical diagnostics as often as they deemed appropriate.